How are you all doing today? I hope your week has been full of creativity. I am also very, very excited to share with you my most recent favorite stamp...which just so happens to be on SALE for a limited time ;) So here we go! 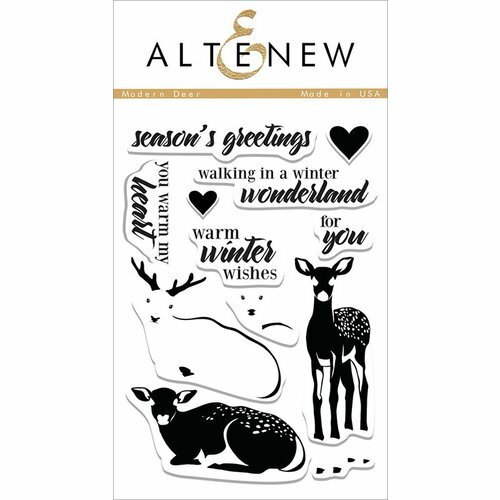 Before we get into the nitty gritty, SB.com is having a huge sale on Altenew products over the next three days. The sale is happening until midnight, Thursday Sept. 20th and most of the stamps are 20% off or more! 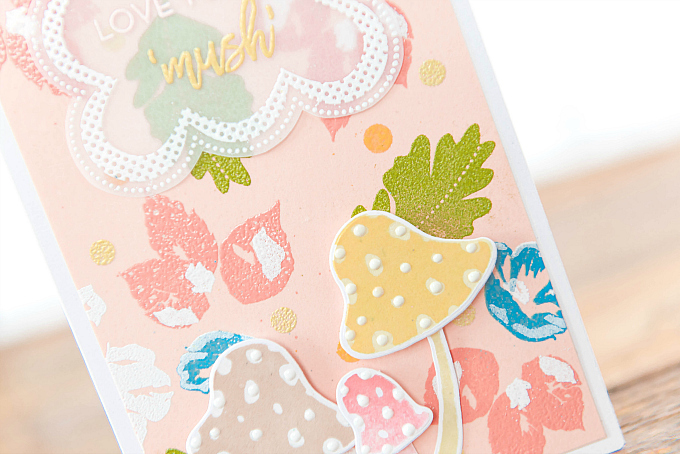 My favoritest, cutest little mushroom stamp used above is only $12 right now! And so are way too many others I love! 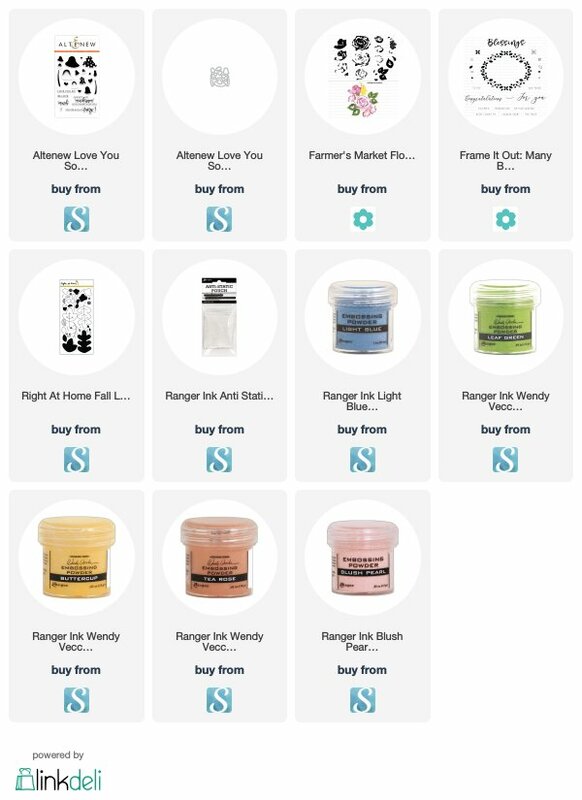 It's a steal - so I couldn't help but share this wonderful sale with y'all. 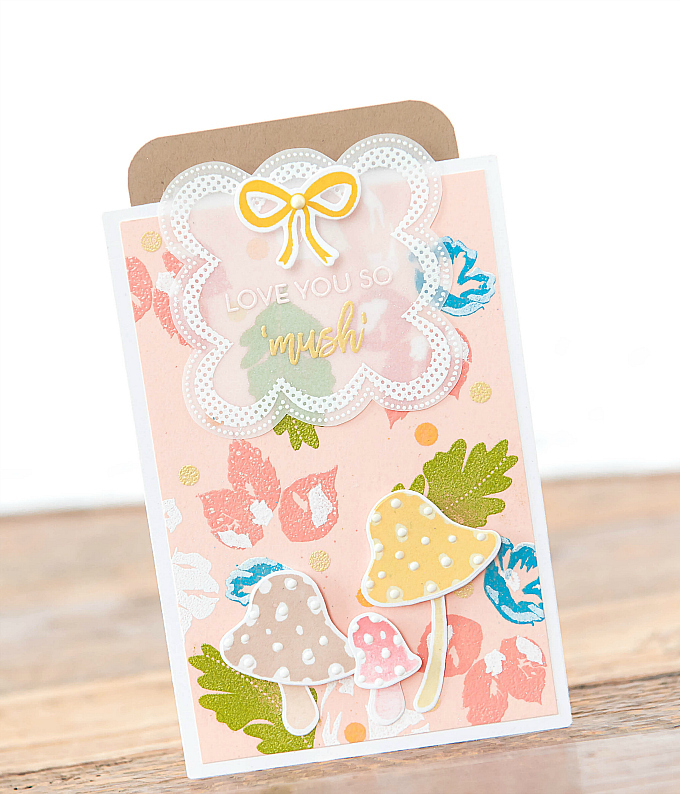 I've added links below for the adorable mushroom stamp, but you can also find it here and the matching die here. I've updated some of my other recent posts, such as this one , this one, and this one to include the sale links also on other fave stamps + dies. And I also just recently got this beautiful new stamp in the mail, so I have to share it! I'll be sharing cards using this sweet set very soon! 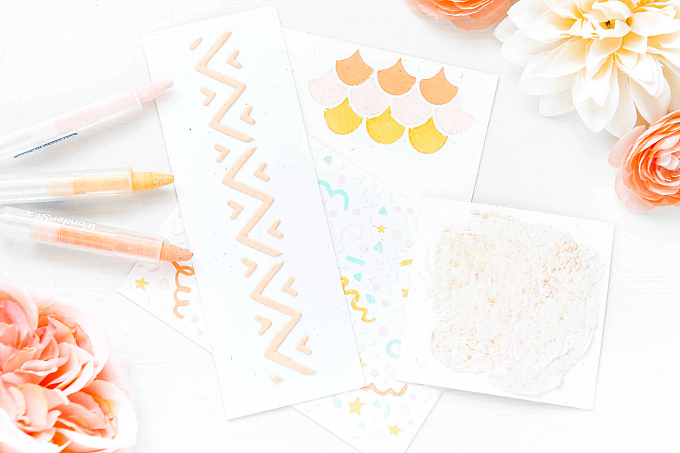 To start things off, I used a soft peach cardstock, followed by stamped flowers and leaves from PTI's Farmer's Market Florals and Rosie Posie (discontinued, but these would look cute). For the extra fun twist of today's technique, I used not one, but two layers of embossing! For the base embossing powder colors, I used Ranger Tea Rose, Buttercup, Leaf Green, and Light Blue. 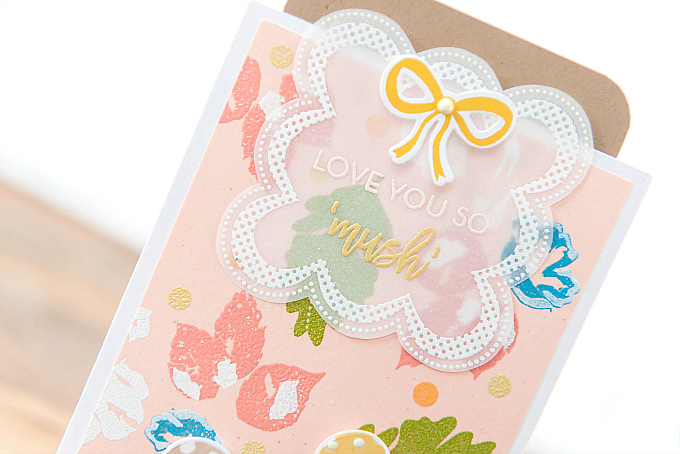 The second layer of stamps was a perfect opportunity to add yet another layer of embossing. I used Ranger's White embossing powder for the final touches. You might have also noticed that I turned this card into a pocket card - they're my absolute favorite! The tiny bit of kraft cardstock takes these vibrant hues right into fall. I used a white base to create the pocket and then adhered my embossed background over the base. At the top, I added a vellum accent, stamped and embossed using PTI's SAF 1940's set (from a few years back, but this set could be a fun switch-up). 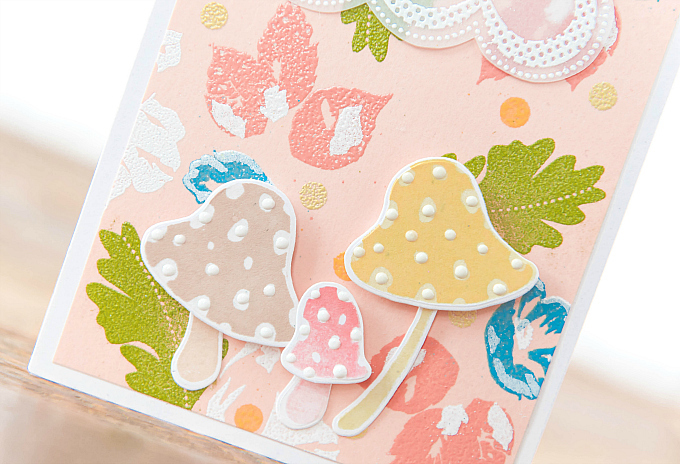 For me, the sweetest part of this card though, is the adorable, colorful, dotted mushrooms! My heart is soooo smitten with this gorgeous set from Altenew. Isn't it so sweet? And the sentiments are so punny and adorable. I used a light pink and light yellow (diy mix of white and Buttercup) embossing powder for the sentiment, and colors of Lemon Tart, Harvest Gold, Pale Peony, Berry Sorbet, Fine Linen and Classic Kraft for the mushrooms. I think I'll be using this technique (and these sweet stamps) many a time again! Thanks so much for visiting and I hope you enjoyed today's quick tutorial. Well if this isn't peachy prettiness, I don't know what is! Those mushrooms are darling and I am over the moon for that pretty little vellum frame holding your sentiment. This is simply dreamy Ivana! Hi sweet friend! I hear ya - embossing was one of the first 'techniques' I learned. But back then, layering stamps was not so easy, was it? So glad we have a world of new possibilities now! Thanks for the visit and sweet notes! Hugs to you dear friend!